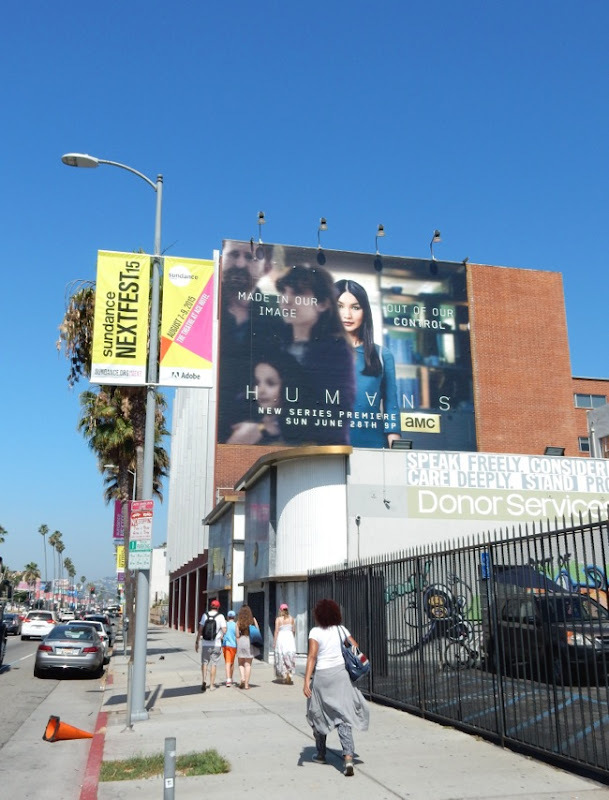 This year has certainly seen an exploration of artificial intelligence on the big screen, with hits and misses from Chappie, to Avengers: Age of Ultron, the excellent Ex Machina and a new Terminator movie imminent, so how will Humans fare on the small screen as it tackles the intriguing subject matter. 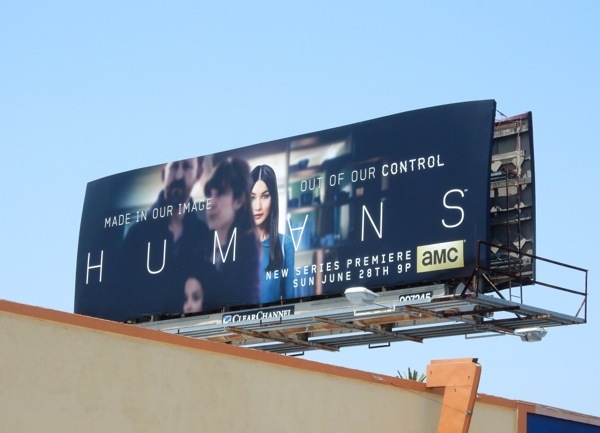 Adapted from the Swedish TV series Äkta Människor (Real Humans), this new British version airing on AMC is set in a parallel modern day world to ours, where eerily lifelike robots, or Synths, exist to serve mankind. 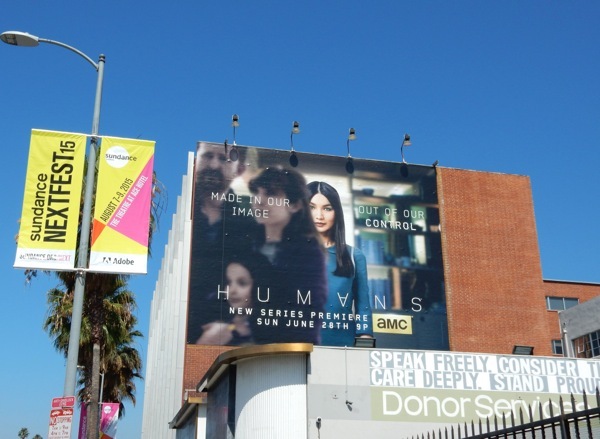 Gemma Chan plays 'Anita' in this fresh slice of sci-fi, purchased by 'Joe Hawkins' (Tom Goodman-Hill) to help his family, against the wishes of his wife (Katherine Parkinson). As you can probably imagine, things don't go to plan. 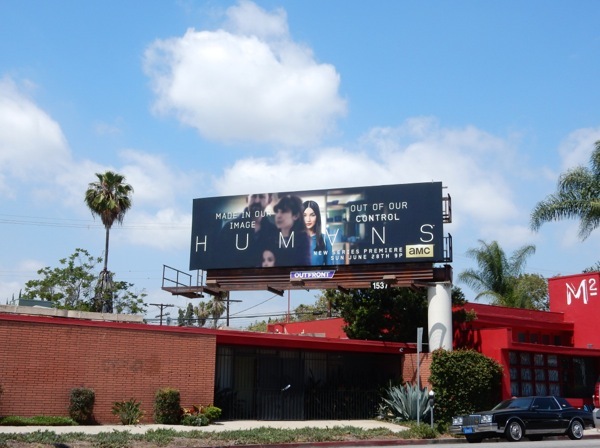 These series premiere landscape billboards for Humans were snapped along La Cienega Boulevard on June 2 and along Melrose Avenue on June 5, whilst the square wall version was spotted on June 18, 2015. 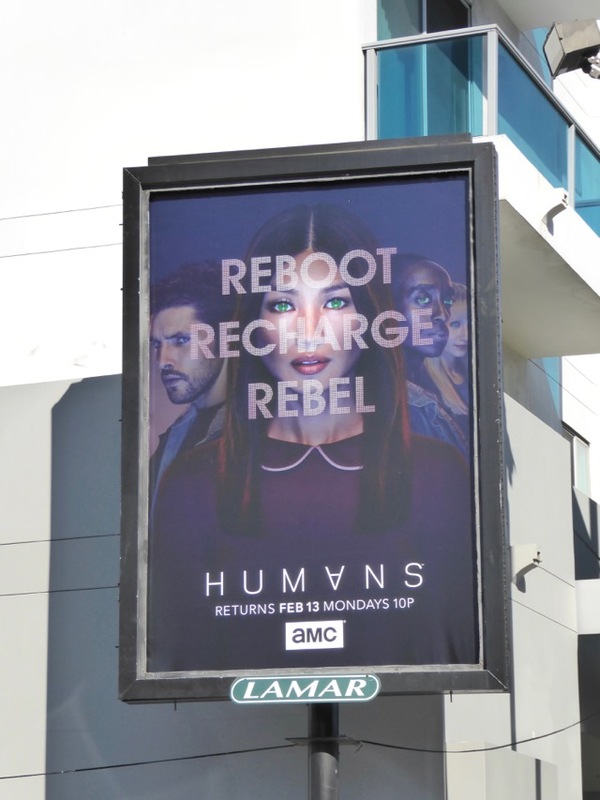 For more science fiction featuring robots, be sure to also check out these Almost Human TV series billboards and Real Steel movie billboards. 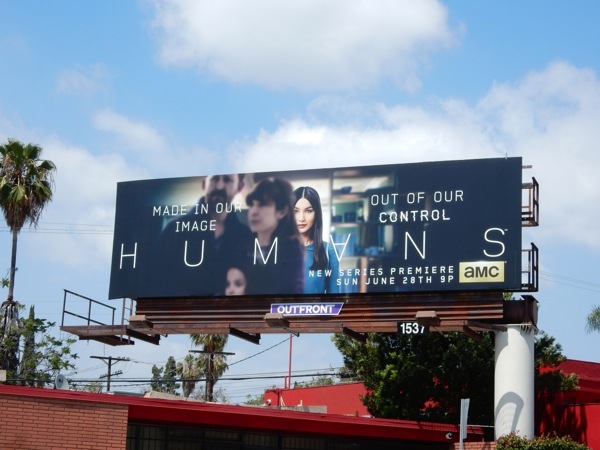 Will this be the rise of the machines you've been waiting for? 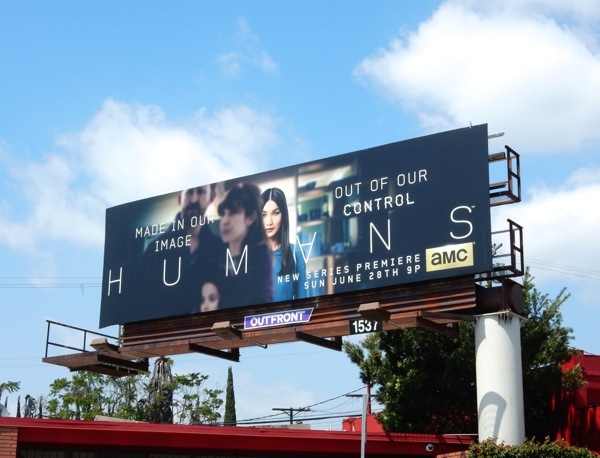 UPDATED: Before Westworld came along, AMC's Humans was exploring artificial intelligence in humanoid form in an everyday way. 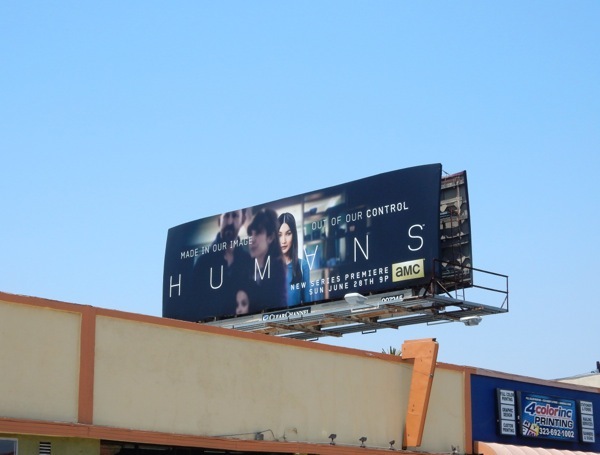 Here's a sophomore season poster and billboard for the show snapped along Fairfax Avenue and La Cienega Boulevard and on January 26 and February 5, 2017, respectively. 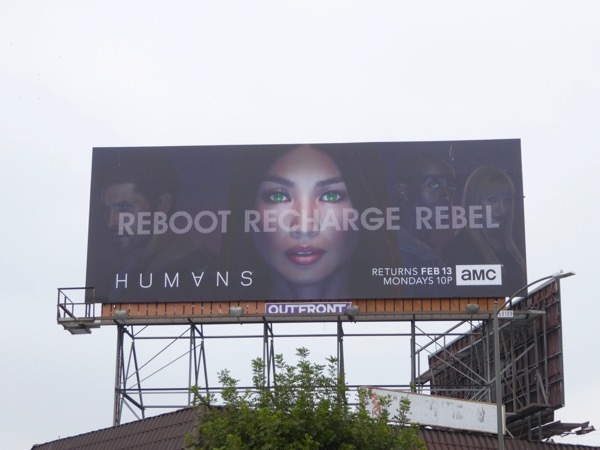 The 'Reboot Recharge Rebel' tagline seems very timely with America's current political climate, especially with a female face (Gemma Chan) so prominent.